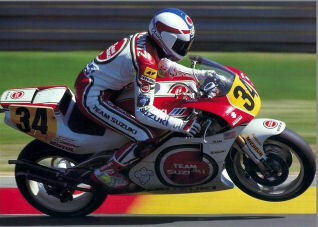 Kevin Schwantz was one of the most spectacular riders from the 'golden era' of GP racing (1988-1993). Had it not been for bad luck, inhuries and the genius, Wayne Rainey, he would undoubtedly have won more than one world ttle. His style was wild and he often road to the limit. In 1994 Schwantz sustained an injury while mountain biking, followed by a big crash at Donington, left his in a poor state to defend his world title, but still finished fourth. He crashed again at 1995 at Philip Island and he decided to retire, since then he has established his own riding school and driven in the Nascar Championship.